CQC is changing the way providers who are part of a Group are monitored and inspected. This covers anyone in a Groups or part of a service organisation such as an OOH and for GPs, any GP Federation, super practices, and multi-speciality community providers. Any organisation working as a group/community will be treated as one single Accountable Care Organisation. This affects NHS Trusts, Corporate Groups, Franchise Operations, Federations, and Out of Hours Services, in fact any organisation connected via common contract bids or as an integrated organisation, or under the umbrella of a branded service. This will allow CQC to compare performance of group members against each other and target poor performing Groups and Federations. CQC will target management of 50% of your services rated as requires improvement or inadequate OR if there is significant concern with some members. Board members to be held accountable for performance. Failing practices will trigger inspection of rest of group AND the head office. Your inspection report will now show that fellow members have failed. The weakest link will drag down everyone in the Federation or Group, who will need to get a better handle on quality standards and ensure that EVERY member will pass CQC inspections. If you are a member of such a group, you should be very concerned if any fellow member is not up to standard. The changes affect Groups, multi-discipline providers, and providers who are part of one Group/corporate entity. If you are a board member, you need to be aware how individual members’ performance will now impact on your duties and responsibilities as a Board Member. Provider Level Assessment: Head office will go through a more formal audit and the Federation or Group given a “Provider-level assessment and rating based on member performance. Board members will be subject to KLOE assessment, primarily the Well-Led test, and held accountable for member failings. 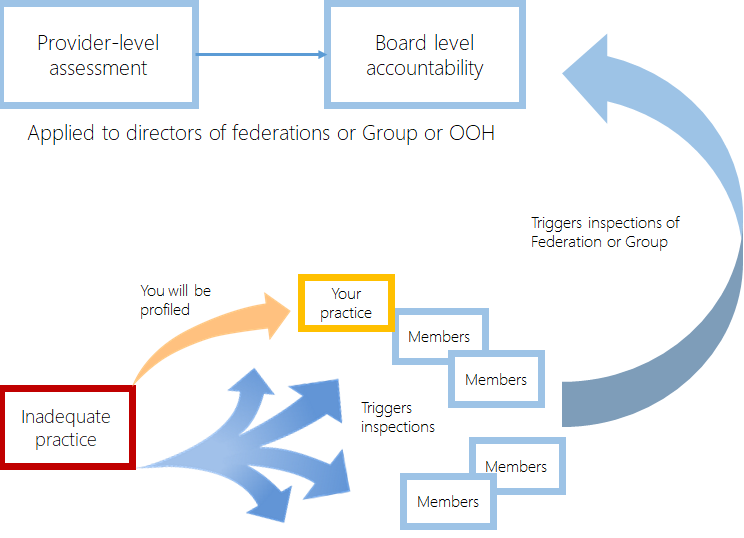 Targeting of the Federation if individual members are found to be inadequate or require improvement. Everyone’s inspection report will now mention failings of group members. Performance variation and differing quality standards is the critical area to tackle. What makes this challenging is the absence of standardisation across the membership and lack of co-operation and shared standards between members.